Looking for beautiful hand-crafted gifts? Here’s your perfect solution: the 31st annual Bainbridge Island Winter Studio Tour! From December 5th through December 7th the tour will feature hand-crafted artwork displayed by 62 local artists in nine studios and community halls around the island. An impressive selection of locally-made, original artwork will include paintings, pottery, jewelry, photography, glass, fiber, metal, sculpture, and fine woodworking. 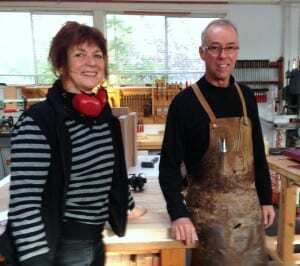 Furniture makers Birgit Josenhans and Robert Spangler in their West Blakely studio. In this episode of “What’s Up Bainbridge,” BCB host Annie Osburn interviews local furniture makers Robert Spangler and Birgit Josenhans, whose West Blakely woodworking studio is one of the nine locations on the tour. For more than 35 years, Spangler has devoted himself to the craft of fine woodworking. Josenhans assists in the process of designing and building, and also creates a line of boxes, boards and benches appropriately called the “B-Line,” made from locally harvested woods and sustainable materials. 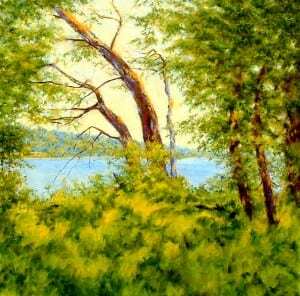 A twice-annual island art show tradition, the Studio Tour welcomes patrons into local artist studios, providing an opportunity to meet the artists and learn about their craft. The Studio Tour can be enjoyed all in one day, or spread out over a leisurely three days. Studios are open 10 to 6 on Friday and Saturday, December 5th and 6th, and 10 to 5 on Sunday, December 7th. The nine locations on this year’s tour include: the Robert Spangler Studio, the American Legion Hall, the Filipino American Hall, Strawberry Hill Mini Gym, the Waterfront Park Community Center, the Grange Hall, Siebert Pottery Studio, Hidden Cove Pottery & Tile, and Seabold Hall. Visit www.bistudiotour.com to download a brochure and map of the tour venues and learn more about this winter’s tour. Credits: BCB host, producer and text author: Annie Osburn; BCB field tech and audio editor: Tim Bird; BCB social media publisher: Diane Walker.